A smaller backing plate to accommodate 6.5” pads! 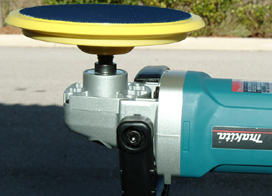 Traditionally, you had to use large 7.5” or 8.5” pads with a rotary (circular) polisher. The option of using smaller pads just wasn’t available. Though these large pads cover more area faster, some prefer the increased control of a smaller pad. That’s why we now offer the Rotary 4 ¾” Flexible Backing Plate. This little plate gives you the same stability and quality of the larger backing plate, but it can be used with a 6.5” D.A. pad. Machine polishing is all about comfort. You find your own techniques and tools that are best suited to your skills and needs. If you are most comfortable using a 6.5” pad, we want you to have the best backing plate for them. The 4 ¾” Flexible Backing Plate is perfect for the 6.5” pads because it provides ample space between the edge of the pad and the edge of the plate to prevent accidental scratches. Plus, if you also have a dual action polisher, you can use the 6.5” pads you already have for your rotary, too! 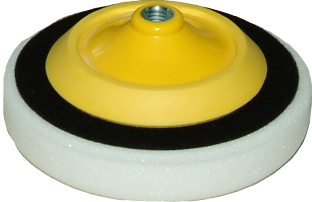 The 4 ¾” Flexible Backing Plate is made of flexible, molded urethane. It bends to allow the pad to conform to the curves of your vehicle. The result is an even finish with less risk of buffer marks. Inside the plate, steel struts are molded to the center hub for greater stability and balance. Your backing plate will remain balanced through countless uses so you always get an even finish. Another benefit of urethane is its resistance to heat. This backing plate minimizes heat transfer from the polisher to the paint to prevent burning, and spontaneous heat build-up is reduced. The 4 ¾” Flexible Backing Plate features Hook & Loop backing to accommodate our 6.5” D.A. pads. Change pads quickly and easily by pulling one off and pressing another onto the backing plate. Please note: You must use this small rotary backing plate with the 6.5” D.A. Pads. Do not use the 6.5” pads with a larger rotary backing plate because you run a greater risk of scratching the paint. Polish how you want to, and we’ll supply the tools! The Rotary 4 ¾” Flexible Backing Plate allows you to use 6.5” D.A. pads on your rotary (circular) polisher. This backing plate was easy to install and held up great after polishing several windows on my car. ProsEasy to install\remove and holds up well. well i will start this off by saying there is a reason i gave it 4 stars and that is only because its only flexible around the outer 1/2 inch of the backing plate, wish it was more flexible towards center. but it is a good working backing plate,great hook&loop backing on it holds nice and strong!, light weight, great build quality, and alot better then a totally stiff backing plate. definitely worth the price for 5.5" pads! backing plate screws on easy with a secure fit. velcro holds pad firmly. also offers versatility as you can use the same pads on your PC and rotary !